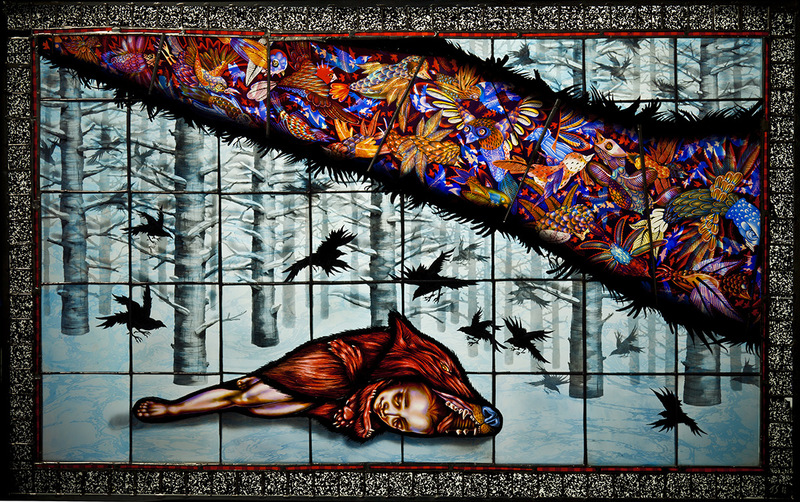 Stained glass artist, Judith Schaechter, puts her own unique and modern twist on the medieval art form of stained glass windows. 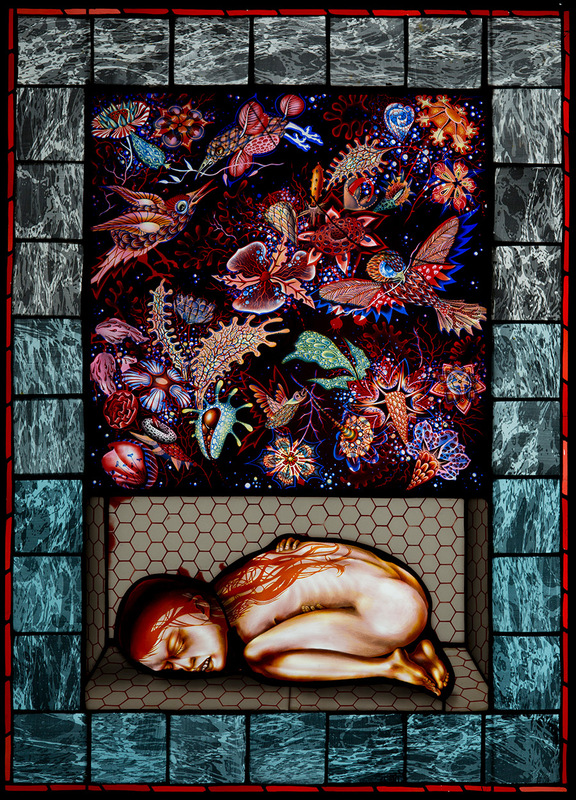 Based in Philadelphia, PA, Shaechter’s incredibly intricate and stunning works are exhibited and recognized globally. Her designs are deep, thought provoking, often dark and always beautiful, leaving viewers to be inspired each in his or her own way. 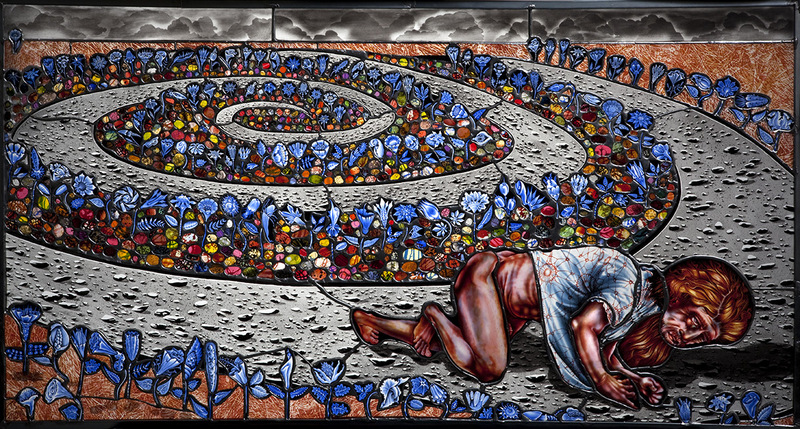 What, for you, are some of the most appealing aspects of working with stained glass? First, it is beautiful—light being transmitted through color…well, doesn’t everyone like that? 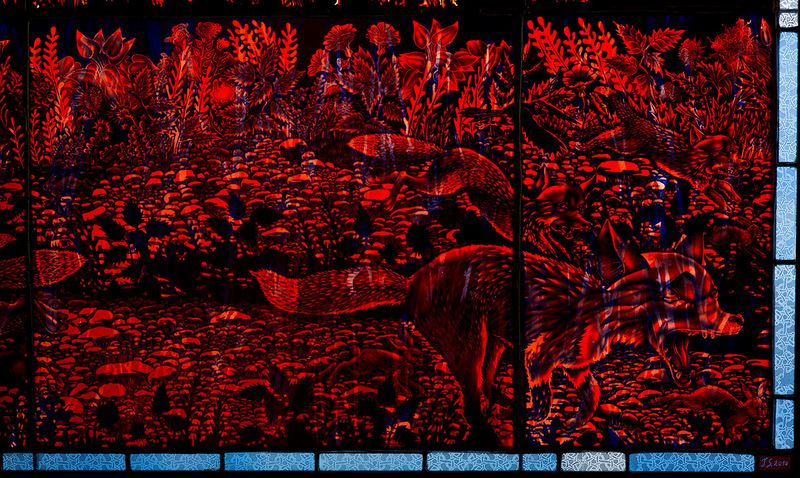 But mostly I like it because making a stained glass window involves many different processes. This allows me to focus and concentrate, something I have issues with. I tend to work fast and carelessly and then throw things out. By the time I manage to do something to the glass, I have developed feelings of attachment and am able to finish. 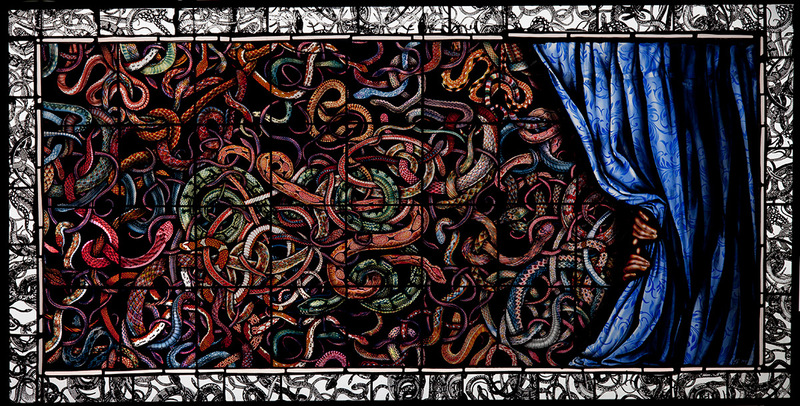 I strongly believe that stained glass is an unlimited expressive and virtually unexplored technical medium–when I get bored with glass it’s something wrong in my own head, a failure of my own imagination which would translate to any medium–so switching would be not only futile but also a cop out. You are a self-proclaimed atheist. 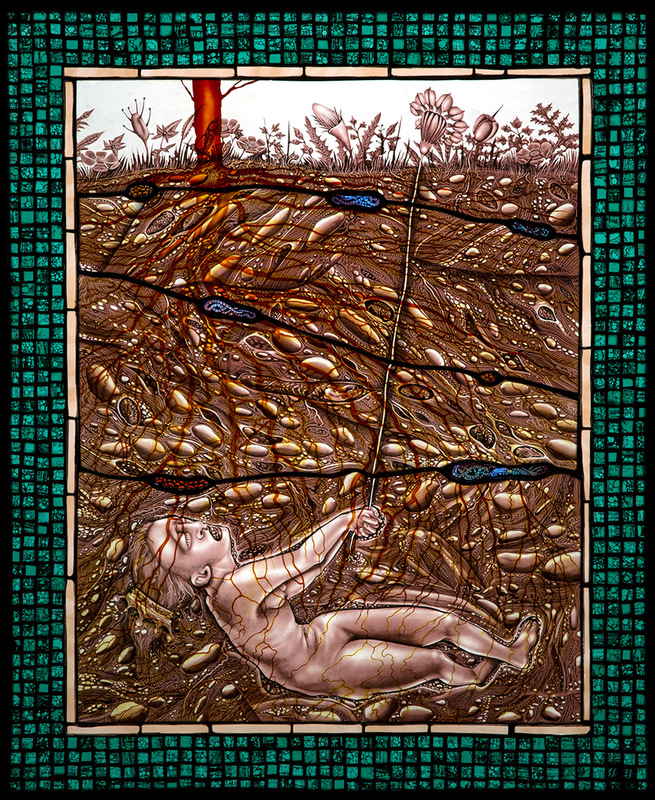 The art of stained glass usually conjures up thoughts of houses of worship and religion. 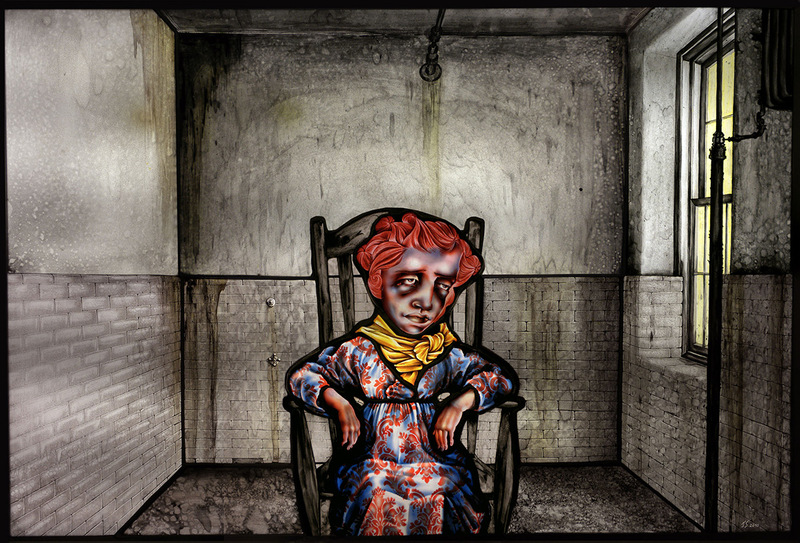 Your work is absolutely beautiful and has been recognized all over the world; and you usually include dark imagery such as distorted faces and figures, with titles such as “Mourning Glory”, “Sin Eater”, and “Feral Child”. How did you come to combine your designs and your atheism into a medium known for its religiosity? There is a spirituality that comes through in your work… Even when your characters seem to be suffering or struggling with something, you still make sure they are surrounded by beauty. Is this your view of life and the human experience? That oftentimes suffering and beauty do go together? 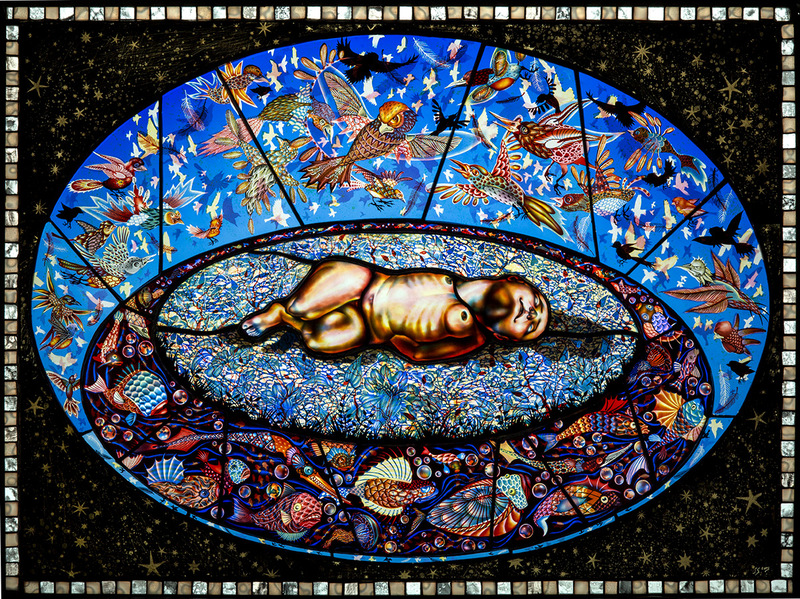 …So the transformation of suffering into visual beauty must be generous, authentic and open. Whatever that means! But I am clear that in my own head, when the chips are down, I am living only because life is beautiful. Rodgers and Hammerstein wrote (in “Cinderella”) “Do I love you because you’re beautiful or are you beautiful because I love you?” This tautology is the essence of faith. It’s the hamster wheel that is the very apotheosis of conscious awareness. We create meaning, truth, and beauty because we CAN, and in turn it keeps us perpetually passionate, engaged, eager. Beauty used to be a synonym for “aesthetic”, the opposite of which is “anesthetic”… So you can draw your own conclusions! As an artist, I try to keep that upward spiral at the heart of what I do. But beauty is tricky. If you assume it’s within your power to create it, you will be shot down. I seek beauty both directly and obliquely, but I never presume its mine to deploy. What does the fact that light illuminates through your pieces mean to you? … Color is pretty, symmetry is pretty, pattern is pretty etc., they can be made beautiful; but radiant colored light streaming into one’s consciousness is sublimely beautiful, supremely seductive and utterly promising. 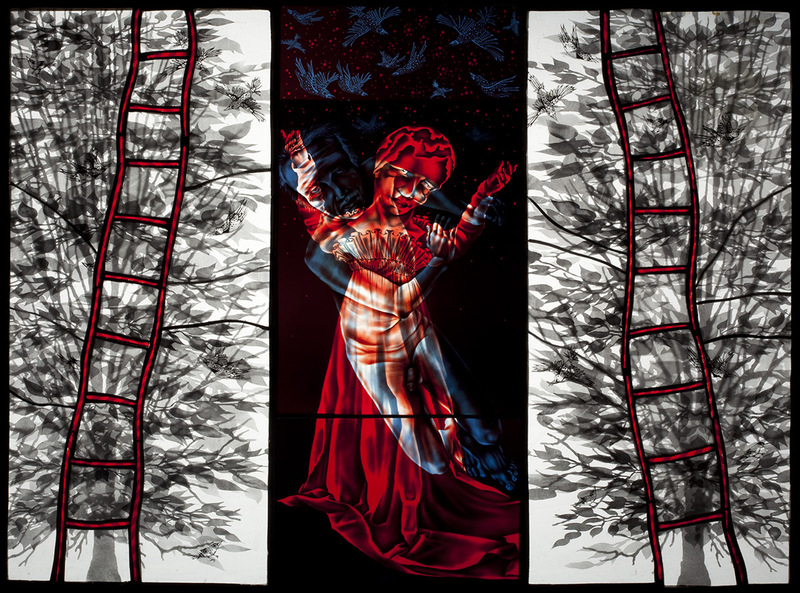 Stained glass is uniquely positioned to capitalize on this phenomenon (as are other radiant media such as film and television). By combining imagery with light, both the viewer and the image are filled with light. So while you are busy identifying and empathizing with he subject (especially if it is figurative), you also experience physically the transforming, warming, filling sensations of light as well. It’s so persuasive not because the pictures are convincing narratives but because the colors are overwhelming and the light is sublime…and, by golly, it’s coming from inside you, it’s part of you. 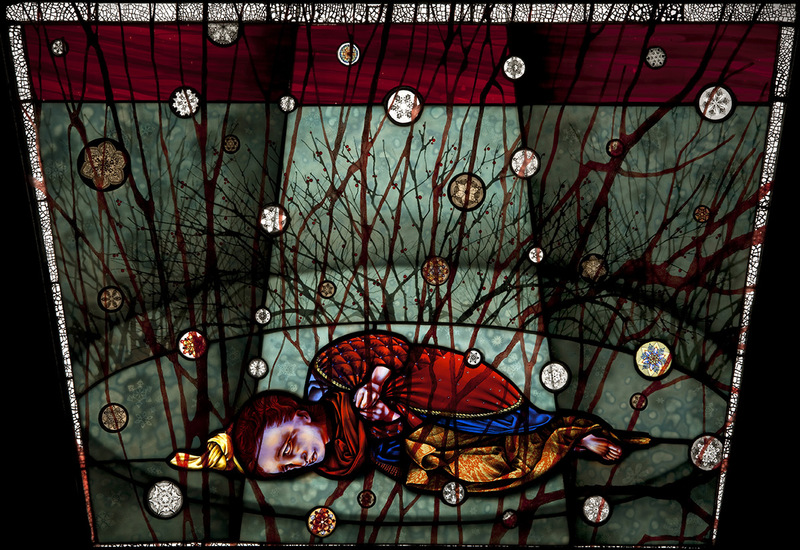 Thus, the impact of stained glass is much more than the act of seeing, much more than the intellectual act of recognizing a picture and more than purely visual, as light is perceived through the skin as warming. In terms of aesthetics, transmission of light, I believe, might be one of the very few universal qualities of beauty that resides in the object (as opposed to the beholder). Owing to the fact that it’s not a metaphor so much as an actual life giving force, it’s one quality that goes beyond “pretty”. On your site you say your work is “centered on the idea of transforming”. What do you hope people think about when they view your work? I hope they feel inspired. I make an effort not to control outcomes in terms of what people get. I hope they get what they need. 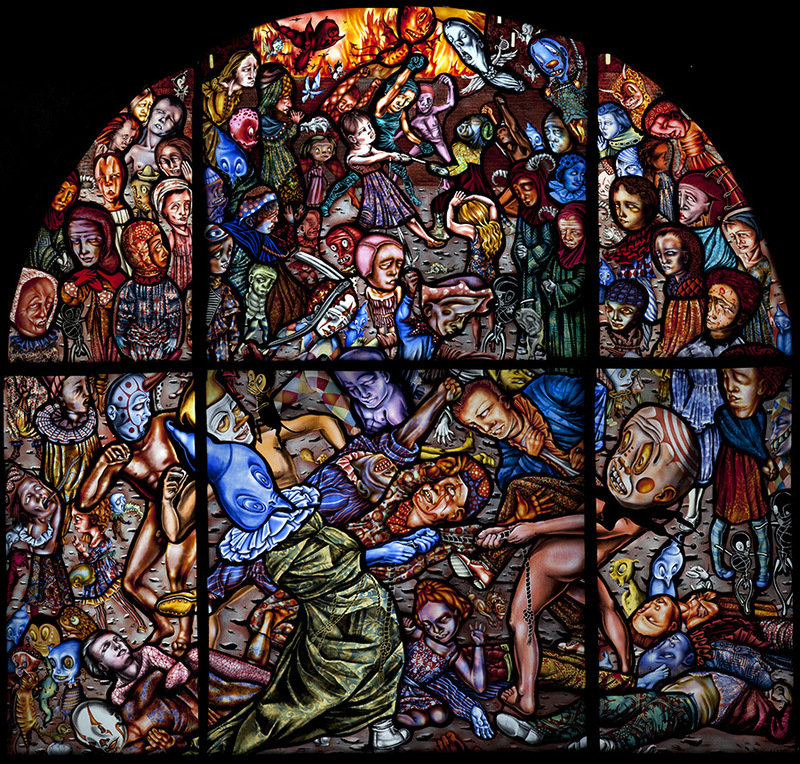 Are there artists, either from the Medieval Period when stained glass became an art form or more modern times, you have been compared to or who have inspired you? I love medieval art. And I love lots of other art as well—I made a list of influences once and it was several pages long. I will include it… VISUAL ART is a primary interest of mine, not surprisingly. Specifically, fine arts, antique children’s picture books, photography, painting, a lot of genre painting (lately I’ve been obsessed with paintings of burning ships), printmaking, esp. Japanese ukiyo-e prints, charts and maps of all sorts, alchemical and esoteric imagery, old food labels, old cigar labels, Victorian ephemera, textile design, Le Petit Journal, Russian Lubok, Krampus cards, playing cards, tarot cards, Chinese propaganda posters, old magician posters, circus posters, game boards, old pulp fiction covers, emblemata, old weird allegorical prints, and much contemporary illustration and underground comics…. …I like glass eyes and fake teeth, weird taxidermy, but not so weird taxidermy is good too (although I do not condone the hunting and killing of animals for sport), old toys, dollhouses, dioramas (I used to want to be a diorama maker), carnival and/or fairground art (including sideshow banners, carousel animals, etc, etc), crazy Xmas light displays, wax museums, weird museums of many types, cabinets of curiosity, Victorian interiors, shrunken heads and “Outsider” art-whatever that is. Mexican shrines, actually, just about any type of shrine or catacomb fries my burger. Grottoes aren’t bad, either. Eccentric, passionate geniuses like Robert Fludd, Jakob Boehme, Athansius Kircher, Nicola Tesla, Lewis Carroll, James Burke, Jung, etc etc all interest me-as does the fine line between visionary and total crackpot. 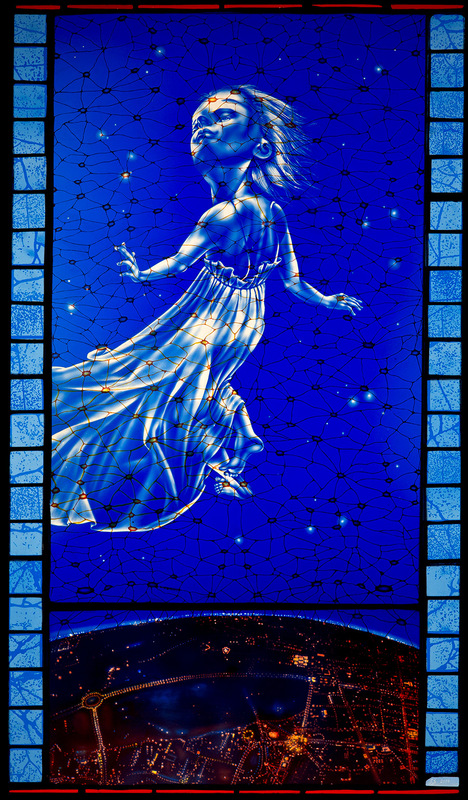 I am also interested in the future of stained glass. In Medieval times, stained glass windows were used in cathedrals and churches to tell stories of the Bible to a mostly illiterate audience. Are there certain stories or narratives that you know you want each window to tell before you begin working on them? I don’t tend to see myself in broad, omniscient terms. I don’t have a message—or story. Narrative is something that exists in time, as stories are sequential progressions. Pictures exist in space—so they can hint at a story, they can illustrate them, but that tends to leave them in debt—a sort of “handmaiden to narrative”. A good work of art is an embodiment, not a re-presentation. In other words, they are an autonomous form, and being spatial and not temporal, they behave differently than stories. The story people get from my work is not in the work—it’s in their head. Which is fine by me! Do you sketch your visions out before you start working on the actual glass piece? On occasion. But when I do, I leave a lot of room to improvise with the glass. I should add: I don’t think I have visions. I use my doodles—but I don’t see those things in my head and then record them. They come into existence only as I draw them. Your pieces are incredibly intricate and detailed. How much does engineering come into play for your selected form of art? 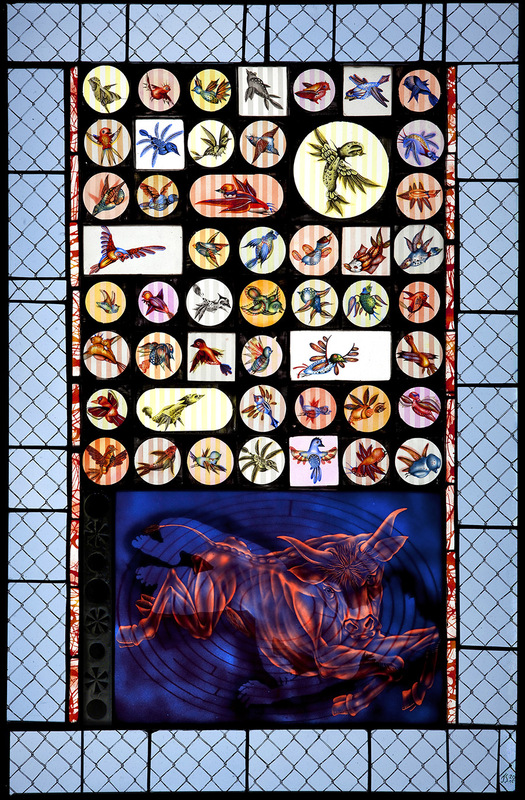 How are you able to bring your images to life in your stained glass works in a way in which every individual piece of glass is manipulated to fit so perfectly to form the final product? Hmmmm…. Since I know nothing of engineering I think the answer is not at all! Are you asking how do you cut the glass to fit a pattern? That’s fairly standard stuff! I use an old steel wheel glass cutter and grozing pliers! Some of the pieces might be bigger than you think. One of the things I do a lot of is layering something called flash glass. This allows me to get a range of colors in one are without having to make a cut line. The work, by the way, is mostly engraved—not painted. 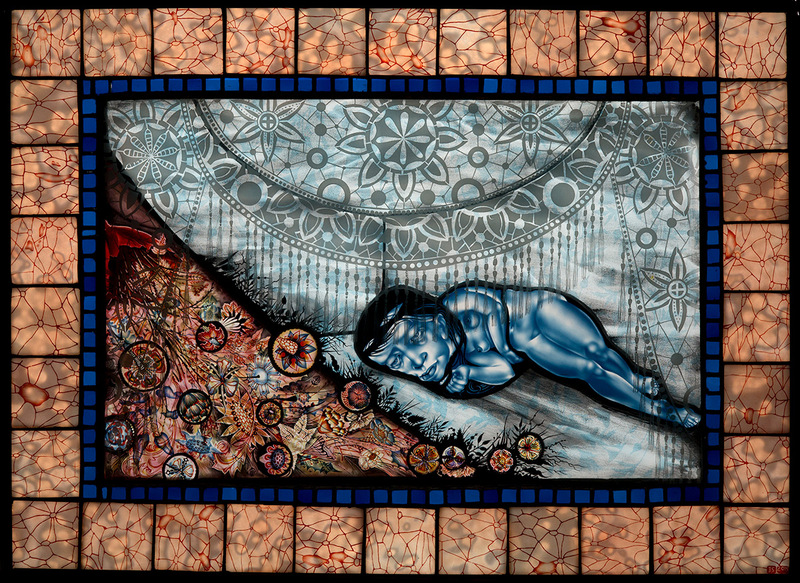 How do you make your pieces and approximately how long does it usually take you to complete a stained glass window? I use a material called “Flash Glass”. Flash glass is a type of glass with a paper-thin veneer of intense color on a base layer of lighter color. First, I cut the glass using a steel wheel cutter and a grozing or running pliers. The next step is sandblasting. This is a process by which one can remove the colored layer, sometimes in stages to get patterns and tones. After sandblasting, I engrave smaller details using a flexible shaft engraver. I also use diamond files to make smooth variations in the color. The only paint I use is black. This fires onto glass at 1212˚ F. I usually do 2-5 firings, as that is the best way to get rich blacks and grays. Sometimes I also use silverstain (which is yellow). After the firings are all done, I get a little additional color with thin washes transparent oil paint. This is all the paint I use–all the other color is the flash glass. One reason there is a lot of color in each section of my pictures is that the flash glass is layered—usually two or three layers deep but up to 5 deep occasionally. You have also taught workshops and courses all over the world and currently teach at the Pennsylvania Academy of the Fine Arts and The University of the Arts. Can you share one piece of advice you give to all of your artist students? My advice to students…. Love your work as though it were an entity separate from yourself, as you might love your own child (or a puppy, if that’s more appealing). To see your art as merely an extension of yourself will not allow it to grow on its own terms and it will never escape the gravitational pull of your own ego. If you can love it like another, then it can outdo you, it can surprise you, it can love you back and it can survive you. 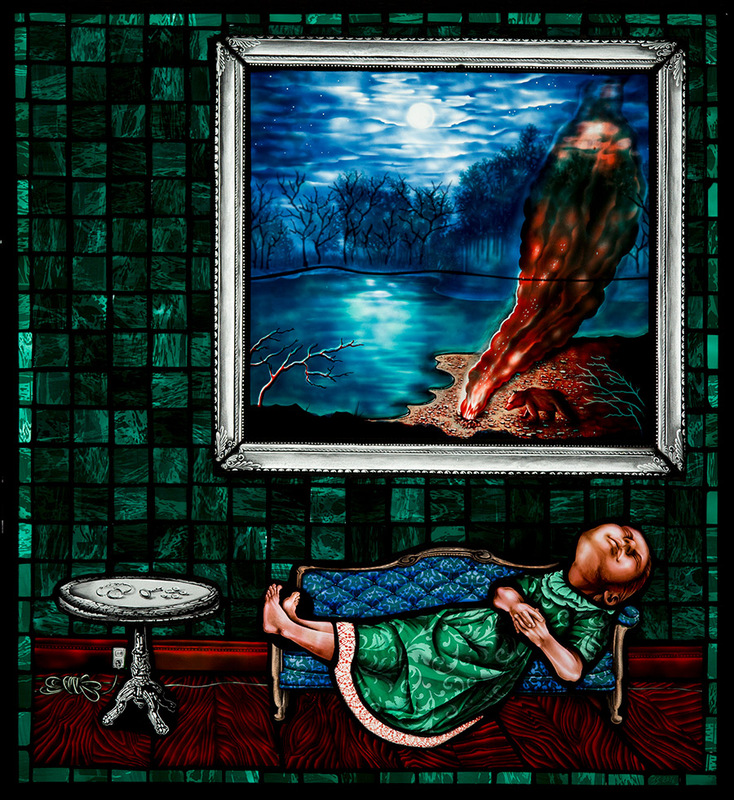 Judith Schaechter has lived and worked in Philadelphia since graduating in 1983 with a BFA from the Rhode Island School of Design Glass Program. She has exhibited widely, including in New York, Los Angeles and Philadelphia, The Hague and Vaxjo Sweden. 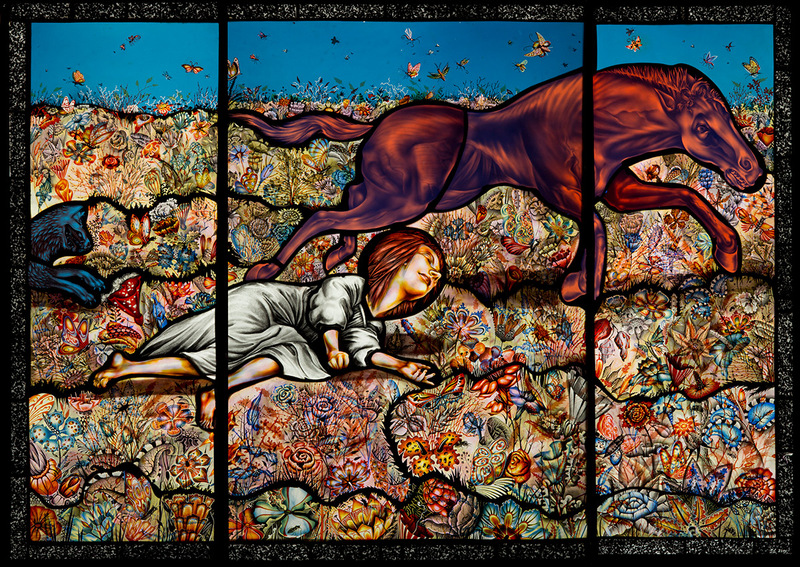 She is the recipient of many grants, including the Guggenheim Fellowship, two National Endowment for the Arts Fellowships in Crafts, The Louis Comfort Tiffany Award, The Joan Mitchell Award, two Pennsylvania Council on the Arts awards, The Pew Fellowship in the Arts and a Leeway Foundation grant.Her work is in the collection of the Metropolitan Museum in New York, the Victoria and Albert Museum in London, the Hermitage in Russia, the Philadelphia Museum of Art, The Corning Museum of Glass, The Renwick Gallery of the Smithsonian Institution and numerous other public and private collections. 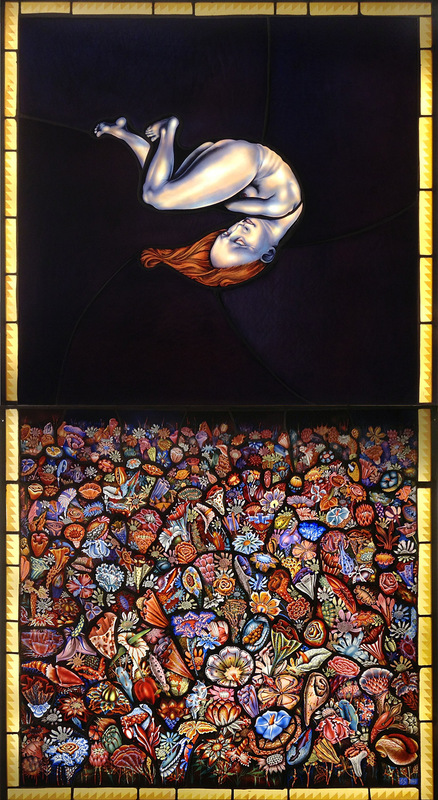 Judith’s work is noted in two survey-type history textbooks, “Women Artists” by Nancy Heller, and “Makers” by Bruce Metcalf and Janet Koplos. 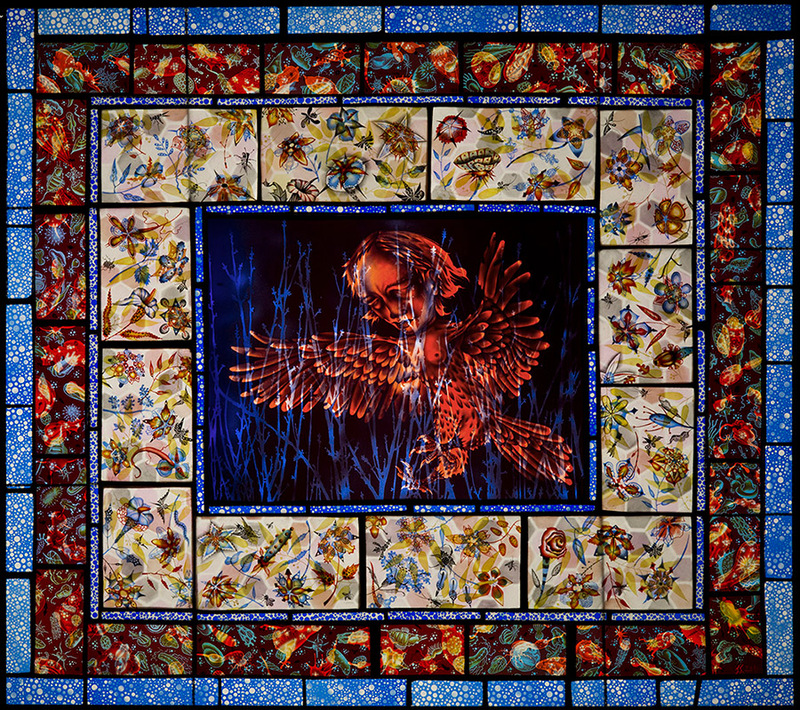 Judith has taught workshops at numerous venues, including the Pilchuck Glass School in Seattle, the Penland School of Crafts, Toyama Institute of Glass (Toyama, Japan), Australia National University in Canberra Australia. She has taught courses at Rhode Island School of Design, the Pennsylvania Academy, the New York Academy of Art and at The University of the Arts, where she is ranked as an Adjunct Professor. 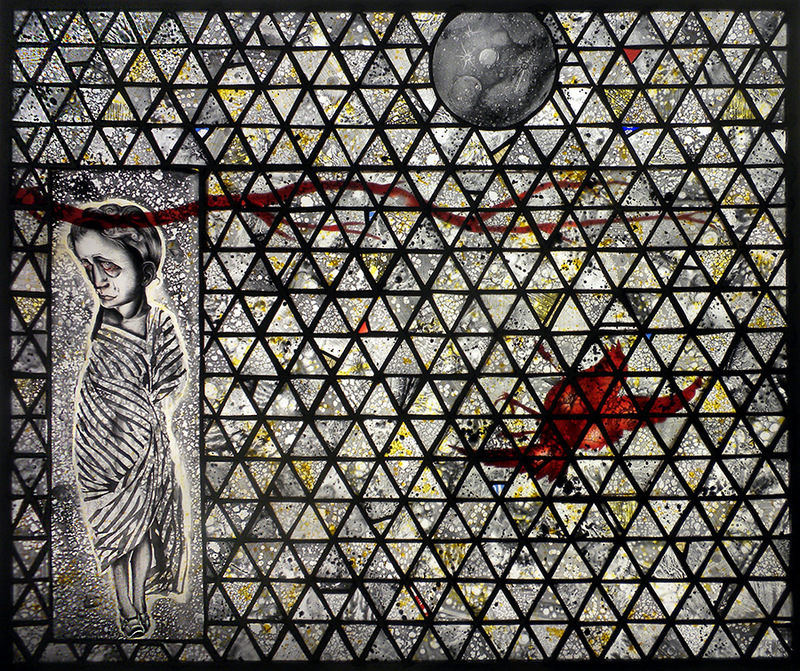 Judith’s work was included in the 2002 Whitney Biennial, a collateral exhibition of the Venice Biennale in 2012 and she is a 2008 USA Artists Rockefeller Fellow. 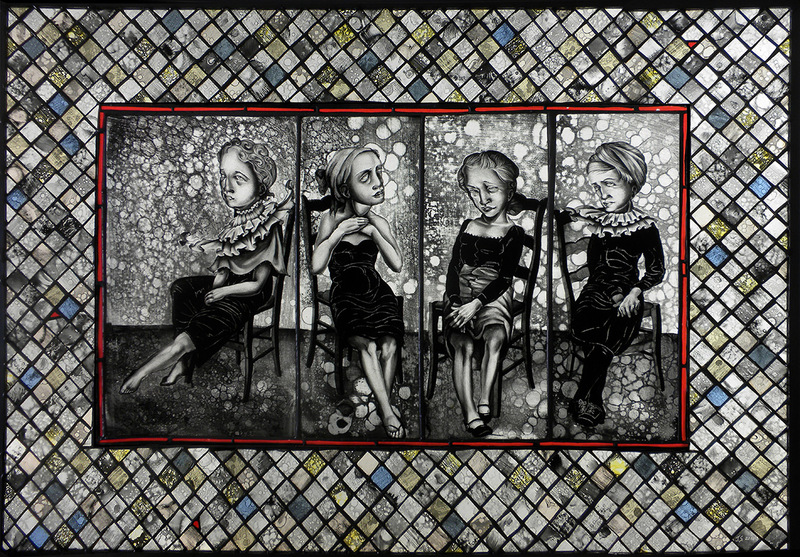 In 2013 Judith was inducted to the American Craft Council College of Fellows.